FCC Releases Computer I Notice of Inquiry. 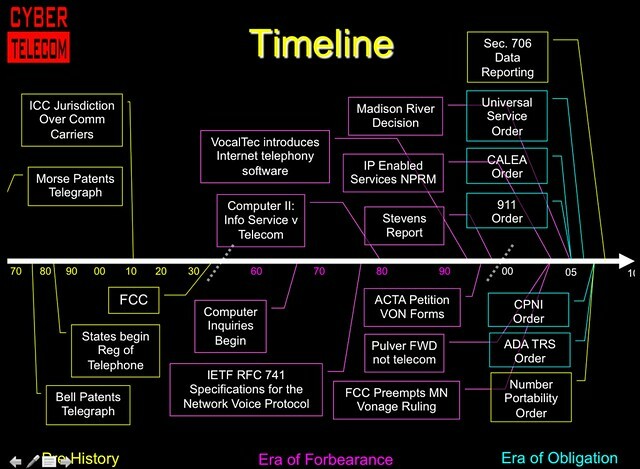 IETF RFC 741 Specifications for the Network Voice Protocol (Nov. 22, 1977) "The major objective of ARPA's Network Secure Communications (NSC) project is to develop and demonstrate the feasibility of secure, high-quality, low-bandwidth, real-time, full-duplex (two-way) digital voice communications over packet-switched computer communications networks. This kind of communication is a very high priority military goal for all levels of command and control activities. ARPA's NSC projrct will supply digitized speech which can be secured by existing encryption devices. The major goal of this research is to demonstrate a digital high-quality, low-bandwidth, secure voice handling capability as part of the general military requirement for worldwide secure voice communication. The development at ISI of the Network Voice Protocol described herein is an important part of the total effort." Computer II Order establishes the Enhanced Service / Basic Service distinction. Net2Phone "announces plans to release first PC-to-phone technology"
ACTA files petition with FCC asking the Internet telephony software be regulated. Voice on the Network Coalition created. Cable Center: "TCI and Time Warner delay planned launches of telephony services to cable subs in several markets; Cox and Adelphia Communications maintain their telephony roll out plans. Delays are due primarily from an uncertain regulatory climate. Technology for telephony over an HFC network is plagued by concern about powering and reliability about 911 and Enhanced 911 services, but launches using traditional fiber and twisted pair cable are possible." Congress directs the FCC to file a report with congress considering the definitions of information service, telecom service, and their impact on universal service. Departments of Commerce, Justice and State, the Judiciary, and Related Agencies Appropriates Act of 1998, Pub. L. No. 105-119, 111 Stat. 2440, 2451 (1997). Rep. Upton's H.R.1291 Internet Access Charge Prohibition Act of 1999 is passed. FCC Chairman Kennard speaks at VON Conference. Sept. 12. S. Petrack and L. Conroy, "The PINT Service Protocol: Extensions to SIP and SDP for IP Access to Telephone Call Services," RFC 2848, June 2000. FCC Releases Universal Service Reform Proceeding. Fed Reg Notice. J. Rosenberg and H. Schulzrinne, "An Offer/Answer Model with the Session Description Protocol," RFC 3264, June 2002. Texas AG Files Suit: During Home Invasion, according to reports, a girl attempts to call 911 on Vonage service but is unable to. VoIP becomes an important part of recovery effort after Hurricane Katrina as circuit switched phones are inoperable. Mayor of N'Orleans talks to President over a VoIP phone.